For a limited time we now have a stock of summer wool fleeces available! Summer fleeces are generally super clean as the sheep have spent all summer on pasture, meaning no pesky hay to clean out! This selection also includes some really special Gotland lamb fleeces that are really fine and soft. For this shearing we also hired a new shearer who appreciates taking a little extra time to produce a high quality fleece for hand spinning. We can certainly see the difference in the fleeces and we hope that you can too! The fleeces were sheared in October and have been skirted so are ready to be washed and processed into wool crafts. Skirting removes any manure, lodged vegetable matter, and wool that is heavily matted or short. We took the time to pick out as much of the small vegetable matter during the skirting process to give you a cleaner fleece. The fleeces are listed below by the sheep’s name with the price of the fleece plus photos showing the whole fleece, a close up, some example locks, and a description of the origin of the fleece, its weight, and staple length. If you see a fleece you would like to purchase, please contact us with the sheep’s name and we either arrange with you to pickup the fleece or prepare it for shipping (buyer pays cost). Click any of the photos below to bring up a full size image to see a fleece in all its glory! 1377 has an uncanny ability to sniff out a treat and get her head into your bucket before the rest of the flock have even noticed you’re there! Her fleece is a nice silver/grey colour with some lighter tips. It has a tight curl and a 4.5-5″ staple. This fleece weighs 3.75lbs and contains very low amounts of vegetable matter. Cost is $95 for the raw skirted fleece. #032 has a white commercial quality fleece that would be good for strong, durable cloth or similar crafting. Her fleece has a 3.5″ staple length and a weight of 3.5lbs. Note that Farmer Ben sheared this lamb and he is still learning the shearing craft so there are more second cuts present that in our other fleeces, that are sheared by a professional shearer. Cost is $10 for the raw skirted fleece. #025/31 has a white commercial quality fleece that would be good for strong, durable cloth or similar crafting. Her fleece has a 3.5″ staple length and a weight of 3.8lbs. Note that Farmer Ben sheared this lamb and he is still learning the shearing craft so there are more second cuts present that in our other fleeces, that are sheared by a professional shearer. Cost is $10 for the raw skirted fleece. Black/dark grey Gotland wool that has been cleaned and processed into rovings ready for spinning and other crafts. Cost is $25 (+HST) per 8 ounces. Grey/light brown fine Romney wool that has been cleaned and processed into rovings ready for spinning and other crafts. Cost is $25 (+HST) per 8 ounces. 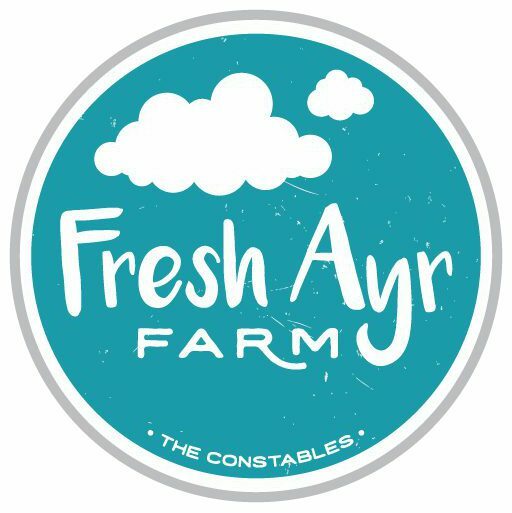 Beautiful frosty morning on #freshayrfarm !